General Atomics MQ-9 Reaper RPA. The debate currently under way over the ethics of using RPA is frequently misdirected (US Air Force image www.af.mil). 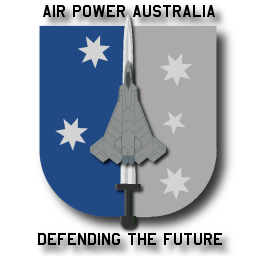 In this very first issue of the Air Power Australia Essays on Military Ethics and Culture series, LtGen David Deptula, USAF (Retd), explores the debate on the ethics of using Remotely Piloted Aircraft (RPA) in combat. Using remotely piloted aircraft as another means to exploit the advantages of operating in the third dimension of air and space is becoming a complex issue. Beyond the technical, operational, and developmental issues that will affect the vast potential of unmanned aerial vehicles (UAVs) in the future, there are a series of policy and strategy implications that are the subject of this article. It will address the widespread misunderstanding of just how effective, ethical, and precise UAVs are as tools in our airpower toolbox. In the hands of good strategists, they can be very beneficial in contributing to the accomplishment of security objectives. That the persistence that UAVs provide allows time to observe, evaluate, and act very quickly, or to take all the time necessary to be sure of a particular action. UAVs allow their users to project power without projecting vulnerability. UAVs are one of the most precise means of employing force at a distance in a way that reduces collateral damage, and minimizes unwanted casualties. 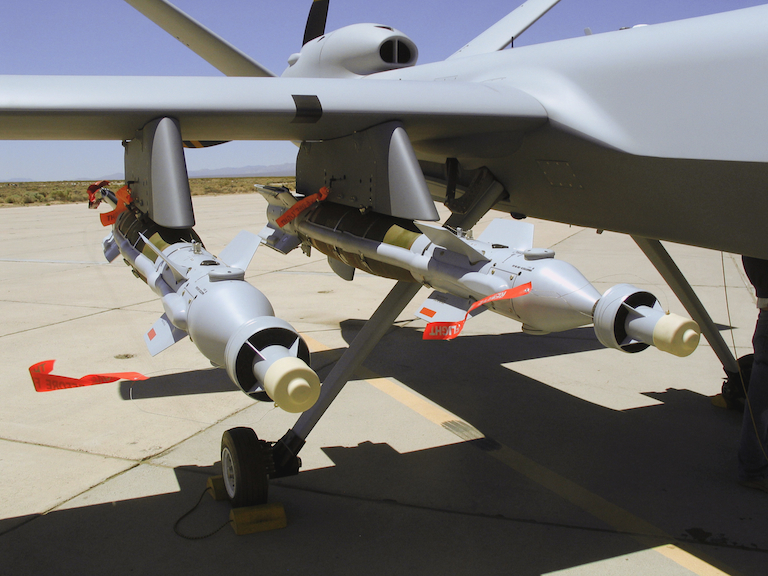 UAVs allow for more “ethical” oversight than any other means of force application. UAVs operate beyond current adversaries' ability to stop them, they provide users an asymmetric advantage relative to opponents that do not possess them, or the ability to stop them. These issues are subject to much confusion and misunderstanding. Part of that confusion is due to the continued use of inaccurate terminology. Airpower today, and in the future, is not, and I predict, will not be “unmanned” in its application. It may involve the use of aircraft that are uninhabited by humans, but the application of those aircraft and the associated “airpower,” will not be. Aircraft will be controlled by people—to what degree of autonomy they will be allowed to posses is where lie significant policy implications. In fact, officials in the U.S. Federal Administration Agency have stated that the single event that significantly moved progress forward in incorporating how remotely piloted aircraft can be incorporated into controlled airspace, was the introduction of the term “remotely piloted aircraft,” because it brought realization to the Federal Administration Agency that a human was actually in control of these vehicles. The media likes to use the term “drone.” They use it because it is only one word and they don't have to explain "remotely piloted aircraft." In military parlance, a “drone” is a flying target—not a multi-role aircraft with a variety of intelligence, surveillance, reconnaissance sensors, and precisely accurate weapons controlled under the watchful eyes of operators informed by multiple intelligence sources. Furthermore, the word “drone” connotes a degree of autonomy that remotely piloted aircraft or UAVs simply do not possess. The continued use of the term “drone” perpetuates many of the misperceptions regarding these aircraft. In actual fact it takes nominally over 200 people to operate and exploit one MQ-1 Predator or MQ-9 Reaper orbit using a remote-split concept of operations. There is nothing autonomous about weapons employment from these aircraft—they are piloted with a human in the loop; the pilot is simply remote from the aircraft—ergo the accuracy of the term “remotely piloted aircraft.” This little-known fact among those who question the use of remotely piloted aircraft is one of the reasons that their use allows for much greater ethical oversight than any other weapon. The truth is, remotely piloted aircraft are one of the most precise means of employing force at a distance in a way that reduces collateral damage and minimizes casualties. Naysayers do not understand the reality of what they call “drone” operations, nor do they comprehend that our adversaries are most certainly conducting an aggressive perception management campaign on this issue—an effective one if the recent negative attention given to remotely piloted aircraft use is applied as a measure of effectiveness (MoE). Remotely piloted aircraft allow users significantly greater control, oversight, and review before a shot is fired than occurs using manned aircraft, or operations conducted by soldiers, sailors, airmen or Marines. The persistence, situational awareness, and degree of control possible with an remotely piloted aircraft allows for the immediate suspension of a lethal engagement if circumstances change or questions emerge—even after a weapon has been released or launched. Remotely piloted aircraft are networked aircraft, and their data can reach any spot on earth in less than two seconds. Hence, in addition to the hundreds of operational, maintenance, and intelligence personnel, many lawyers and senior leadership are directly involved with remotely piloted aircraft lethal engagements. That kind of oversight is rarely — if ever — the case with the use of manned aircraft, or with boots on the ground, special operations forces, or sailors at sea. 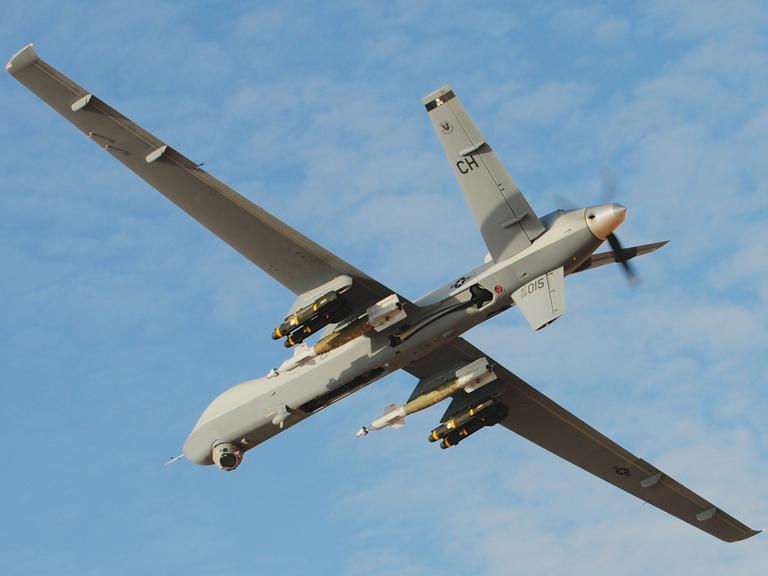 The power of intelligence networks allows remotely piloted aircraft to essentially carry around their own command and analysis center, and legal counsel, as an integral part of their “virtual payload”. Relative to other means, remotely piloted aircraft are the most precise way of employing force at a distance in a manner that reduces collateral damage and minimizes casualties. The accuracy of weapons employed from a remotely piloted aircraft is such, that error are nominally less than 10 feet. The accuracy of an unguided 155mm howitzer round is around 1,000 feet, and mortar accuracy ranges from 200 to 800 feet. None of the procedures governing the use of artillery, mortars, missiles from ships, or manned aircraft employ the oversight associated with the use of networked remotely piloted aircraft. Furthermore, every second of a remotely piloted aircraft’s high-fidelity video footage, communication, and aircraft flight parameter data is recorded and stored for very precise review and evaluation. This, ironically, is one of the reasons there is so much attention on what the media label as “drones”. Imagine if one could see the results of every missile, artillery, mortar, and rifle round fired. A principal value of remotely piloted aircraft is that they provide a perspective only available from operating in the air, and persistence to a degree much greater than an aircraft occupied by a person. The ability of remotely piloted aircraft to fly over one spot for a very long time allows those flying it to observe, evaluate, and act very quickly, or to take all the time necessary to be sure they can do what they really want to do. That precise and persistent regime of engagement is simply not available to other types of weapons. All that said, in the future oversight and control of these vehicles will become a more significant issue as greater autonomy is incorporated onto these aircraft. This is an area that will be full of debate regarding the balance between the degree of autonomy that facilitates the advantages of air operations, and the degree of autonomy enabling actual weapons employment. Several human rights and arms control organizations seek a complete ban on fully autonomous weapons systems. In the United States, some localities have already banned certain uses of remotely piloted aircraft over their towns. Bans of remotely piloted aircraft are analogous to banning axes, chainsaws, automobiles, guns, airplanes, or even forks, all of which can be used for good or malicious purposes. It is not the tool that is the determinant of how it will be used, but the application of the tool by the human being who is using it. A rightful concern of the subject is how much automation should be allowed in the next generation of weapon systems. However, we are not yet at that stage with the remotely piloted aircraft that are employing weapons today. Several well meaning, but misguided, commentators are calling for a new doctrine to guide what they call “drone” warfare. Some have even gone so far to suggest that, “We are in the same position now, with drones, that we were with nuclear weapons in 1945.” (David Remnick, editor of The New Yorker). “Drones” do not define warfare — they are tools used as part of its conduct. Accordingly, they should be regarded and employed as all other “tools” of war are, in accordance with the law of armed conflict (LOAC) and congruent with the Geneva Conventions. With respect to warnings on consequences, some have gone so far to postulate that the use of a remotely piloted aircraft allows the adversary to paint us as “distant, high-tech, amoral purveyor[s] of death.” Doing so ignores the real motivation of our adversaries in decrying their use. A significant advantage of remotely piloted aircraft is that they allow us to project power without projecting vulnerability — something that can not be done when ground forces are put in harm's way. This capability provides an asymmetric advantage that adversaries find difficult to counter. Because remotely piloted aircraft are so effective, enemies try to manipulate the users of those aircraft to do what they cannot — limit the use of that asymmetric advantage — by spreading falsehoods claiming what they call “drones” cause reckless collateral damage or are somehow not accurate. The fact of the matter is that remotely piloted aircraft are one of, if not the most accurate means of employing force at a distance in the military arsenal. Airpower, in the form of remotely piloted aircraft, is the one capability that the Taliban, Al Qaeda, and terrorists in other places around the globe cannot defeat directly. By creating international focus on civilian casualties, and inequitably attributing those casualties to “drones” vice the biggest cause of those casualties — the terrorist organizations themselves—they create political and societal pressure to limit the use of so-called “drones”. Adversary falsehoods regarding inaccuracy and collateral damage attention from the fact that the massive intentional damage, intentional killing of civilians, and intentional violations of international law are being conducted by Al Qaeda and the Taliban—not “drones”. Another disturbing implication of many of the “anti-drone” commentaries is that a standard of warfare should come from some form of “equality” between opponents. From the same Guardian article mentioned earlier, consider this… “There is one school of thought, they note, that suggests that for war to be moral, as opposed to just legal, “it must link the killing of enemies with an element of self-sacrifice, or at least risk to oneself.” War is not about “equality”, or some chivalric notion of “fair play on the battlefield”, it's about inflicting damage on your enemy without suffering damage yourself. 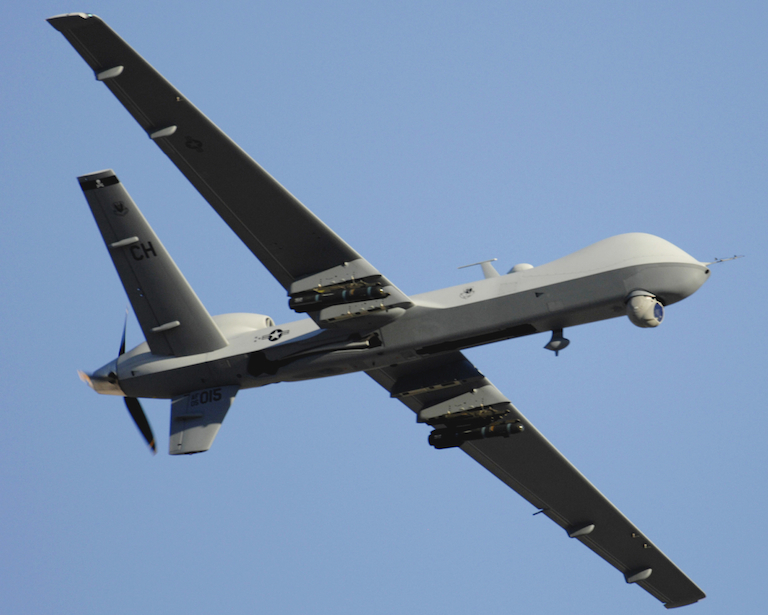 Remotely piloted aircraft provide one of those asymmetries for peace-seeking allies today. The use of remotely piloted aircraft has substantially boosted effectiveness in accomplishing critical security objectives — with zero operator casualties, at significantly less cost, and with significantly less collateral damage than have the surface-force operations in Iraq and Afghanistan over the past decade plus. The “anti-drone” community continues to claim how much ill-will drones generate, but they never discuss how much ill will the alternatives generate. If the people harboring Al Qaeda around the world don't like drones, do you think they like boots on the ground any more? Airpower can inflict an asymmetric sense of helplessness on adversaries, and this could well be why it is such an important element of warfare against twenty first century opponents. As the published reports about the materials found in Bin Laden's hideout indicate, remotely piloted aircraft strikes were what he and Al Qaeda really feared. These aircraft injected fear into the calculus of the enemy as a Clausewitzean friction of the first order. The “anti-drone” critics need to answer first, why they don't want that to happen; second, what alternative they have; and third, who will take the responsibility for the innocents who will be killed each time the opportunity to take out a terrorist is foregone? Despite the value of remotely piloted aircraft, which introduce enormous capability and employment advantages, they are not a panacea for warfare nor will they replace manned aircraft. They are but one tool among many in the set of modern weapon systems. They have advantages and they have disadvantages. However, we should not assist our adversaries by limiting one of the most effective weapons we have against terrorism. Remotely piloted aircraft are weapons that provide the greatest degree of ethical oversight currently possible, with high accuracy, both of which combined reduce collateral damage and thus civilian casualties. Imposing artificial limitations on the use of remotely piloted aircraft will only serve to minimize the asymmetric advantage that currently results from the use of these valuable tools. General Atomics MQ-9 Reaper RPA armed with Paveway IV guided bombs (US Air Force image www.af.mil). General Atomics MQ-9 Reaper RPA armed with Hellfire and Paveway IV (US Air Force image www.af.mil).